Since the beginning of 2003, Professor Dr. Holger Borcherding has been Professor for Power Electronics, Electrical Drives and EMC at the University of Applied Sciences Ostwestfalen-Lippe. Professor Borcherding is a member of the board of the Future Energy - Institute for Energy Research founded in 2017, which develops agile energy solutions in the area of ? ?quarters, mobility and working environments with the help of interdisciplinary research approaches. His 20-member workgroup power electronics and drives researches intelligent energy systems and efficient energy use, especially in industrial applications. Prof. Dr. Borcherding studied electrical engineering at Leibniz University Hannover from 1985 to 1991. He then worked as a research assistant at the Institute for Power Electronics, where he received his doctorate in 1999 in the field of active frontend converter. 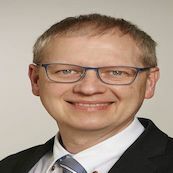 From 1997 to 2000 he worked as a development engineer for power supplies at Piller GmbH in Osterode in Germany, from 2000 to 2003 as a development manager for servo drives at Lenze Drive Systems GmbH in Hamlin. Prof. Borcherding is scientific director and one of the initiators of the DC-INDUSTRIE project.